Visually examine the tank for signs of cracking, crazing or brittle appearance. Check the areas around fittings and where different portions of the tank converge into one another. 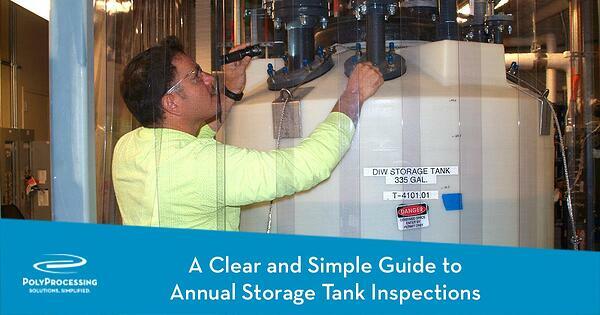 Inspect the interior of the storage tank. 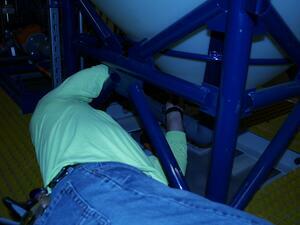 Carefully inspect the dome of the storage tank for brittleness. Check fittings, hoses, gaskets, and all connections for any signs of general corrosion or deterioration and leaks. Check the vents and scrubber piping and make sure they are functioning properly. Confirm that filling the tank from tanker trucks does not cause over pressurization and doesn’t end with a line purge that “balloons” the tank. Ensure the secondary containment of the chemical storage tank is adequate in size, and in good condition. If you need a professional field service technician, Poly Processing can send one to your site at minimal cost. We recommend having a professional perform an in-depth inspection, with testing, every 3-5 years. What do you get with professional tank inspection services? Here’s an overview of the inspection and testing our field service technicians perform on your chemical storage tanks. A close inspection of the chemical tank’s exterior can reveal cracks or crazing caused by UV degradation and other stressors. If cracks are present, a field technician may scrape off a small bit of the surface of the tank to see how deep the cracks go. If they are at least 1/32” deep, further testing may be required. As long as the tank is empty, the field technician can ultrasonically measure the tank wall thickness. This will reveal any corrosion that is eating away at the sidewall, indicating dangerous wear and tear on the tank. The technician can also insert a camera inside to take photos, which will show any degradation or interior cracking. Download our Tank Installation Manual for instructions on do-it-yourself annual inspections. One of the best ways to test the actual polyethylene of the storage tank is to take a sample for impact and gel testing. This will tell you if the tank is holding up under the stress of the chemical, or if it’s reaching the end of its useful life. The ASTM-D 1998 impact test and gel test reveal if the material has become brittle. We take a sample from the dome and plug it with a bulkhead fitting, then send the sample to the lab for testing. When a field service technician inspects your chemical tank system, they will also verify the chemical and tank compatibility. This is especially important if you have changed the chemical being stored in your tank. Even if the structure of the tank itself seems secure, it’s important to test the fittings and attachments for signs of wear. Often, a field service representative can replace a fitting or gasket onsite. The technician will also inspect restraints, ensure seismic clips are spaced properly, and inspect ladders and brackets for signs of corrosion. Venting is critical to the life of a tank, and it’s important to inspect the vent line for obstructions and proper vent sizing. Bird nests, bee hives and other obstructions can collect in outdoor vents, and dust and other debris can collect in indoor lines. Tank interior and exterior: Visual inspection of your tank’s interior and exterior to spot signs of cracking, brittle appearance, and other signs that the tank has potential weaknesses. In some instances, we’ll scrape off the top 1/32” of a small area of the exterior surface to inspect the extent of cracking or hazing. Fittings and attachments: Visual inspection of the tank’s fittings and attachments for signs of fatigue. When present, gaskets are examined as well. We also check the bolt torque on all bolted fittings, inspect any flexible connections to ensure they’re functioning properly and look at valves for signs of leakage. Vent line: Any and all vent lines are visually inspected to detect any restrictions or obstructions. We also check the size of the vent and make any recommendations for improvement. If a scrubber is present, we do a visual inspection for areas of wear. External components of the tank: Thorough visual inspection of ladders, brackets, stabilizers, seismic systems and stands to identify signs of corrosion. All the findings from your tank inspection are presented with photo documentation and any recommendations for repairs or replacements. The report will also make a recommendation for the date of the next inspection, based on the age and condition of the tank and the chemical application. To learn more about tank inspections and to schedule a professional tank inspection, talk to a field service expert today.